Many parking garages are considered as damp locations. 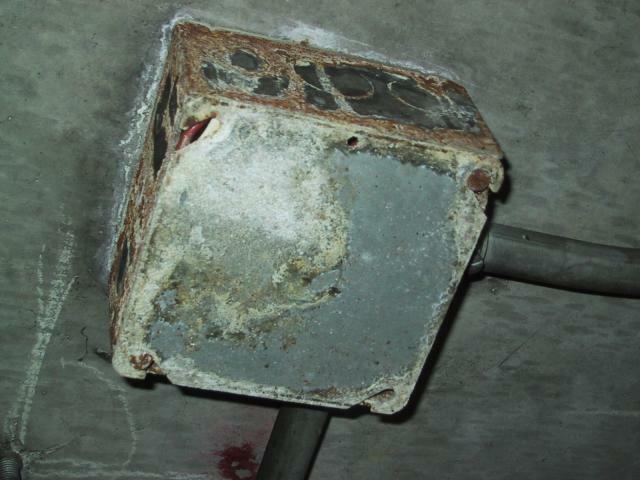 This box shows signs of corrosion and should never have been used here. See 300.6 Protection Against Corrosion. What about the set screw connector? (a) Exposed and Concealed. The use of listed electrical metallic tubing shall be permitted for both exposed and concealed work. (b) Corrosion Protection. Ferrous or nonferrous electrical metallic tubing, elbows, couplings, and fittings shall be permitted to be installed in concrete, in direct contact with the earth, or in areas subject to severe corrosive influences where protected by corrosion protection and judged suitable for the condition. FPN: See Section 300-6 for information on protection against corrosion. PS: This installation was about 300 yards from the ocean. i see it all the time , the salt in the air ,fog and land tend to do this if this was a pvc installation this wouldnt happen. Yep, this sort of corrosion is a problem where I live as well. My back yard goes straight on to sand dunes and the beach, about 40 yd. max. The winter weather by England's North Sea coast brings spray and the salty atmosphere into everything.